Bollywood actor Shah Rukh Khan, who has a huge fan base, always wins the heart with his humble gestures. The proof of his golden heart is the new viral video where he is seen giving a sweet hug to his disabled fan Harshul Goenka just before the match. 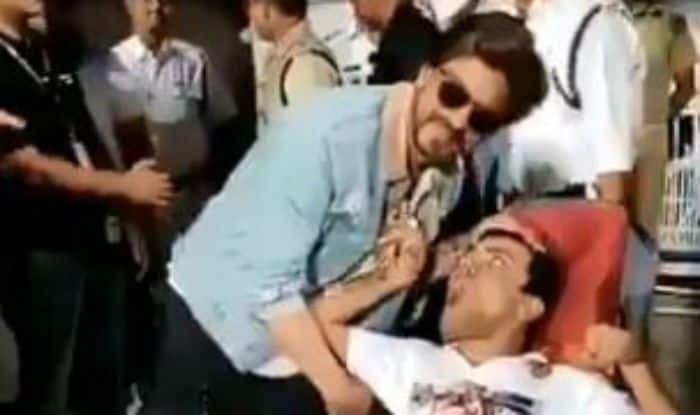 In the video, SRK is seen going forward and giving kisses to the wheelchair-bound fan. Harshul is heard saying ‘I Love You’ to the Zero actor multiple times and SRK even do a gesture and keeping the hand on his heart. The video will melt your heart. The video has gone crazily viral on social media and has garnered 411 retweets and 1,203 likes within a few hours. However, this is not the first time Shah Rukh has met his biggest fan Harshul. Last year, SRK Universe, one of the biggest fans of SRK donated Rs 5,000 every time KKR win the match. Harshul was also awarded Rs One lakh by SRK and cricketer Dinesh Kartik. On the professional front, Shah Rukh Khan was last seen in Anand L Rai’s film Zero along with Katrina Kaif and Anushka Sharma. During the T20 match between Kolkata and Hyderabad, KKR beat Sunrisers Hyderabad by six wickets. Do let us know what do you think of the video.